* Delegate responsibilities. The best gatherings are a team sport. Tackle this recipe for Crispy Baked Wings and let your friends help with snacks, dips, and drinks. * Prep what you can the day before. 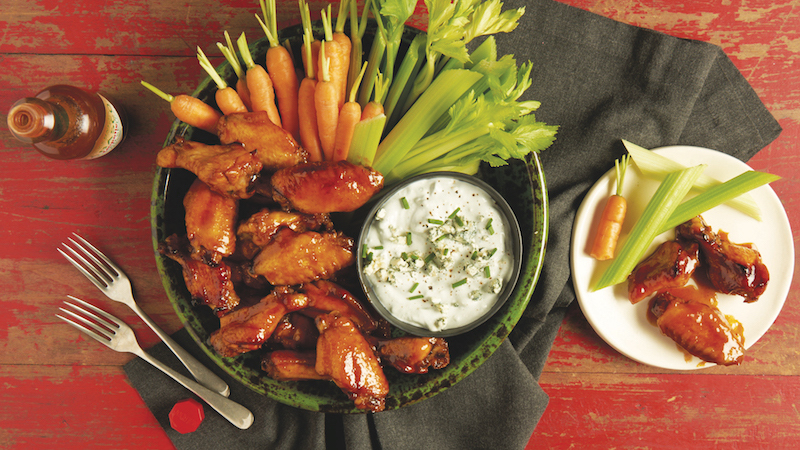 Reduce the time needed to make these wings on game day by prepping some steps in advance. The seasoning blend and sauces can be prepped up to two days in advance, and chicken wings can be separated into drums and flats the day before. * Veggies are underrated. It’s usually a good plan to have a snack that can be quickly replenished for grazers attending your party. Stock up on vegetables that are easy to slice such as carrots and celery. Place some of the cut vegetables out with dips like blue cheese dressing or ranch, both of which can double as classic pairings for your wings. * Redefine “homemade.” The Crispy Baked Wings can serve as a versatile base for just about any sauce you might be craving. Instead of making a sauce entirely from scratch, consider making some quick alterations to premade ones. For example, add an ingredient like Tabasco Chipotle Sauce to store-bought barbecue sauce to impart a smoky flavor and lime juice for added brightness. Small changes can add that unique, homemade quality without all the work. Recipes like Chipotle Barbecue Sauce or Nashville-Style Sauce can complement wings for true crowd-pleasers – pick your favorite or try both. Bake 20 minutes, turn wings over and continue cooking additional 20 minutes in a convection oven or 30 minutes in conventional oven. Cooked chicken should reach at least 180 F internal temperature with crispy texture. Remove from oven. Toss with preferred sauce and serve.